I came across the idea for making preserved lemons (or pickled lemons) while looking for ideas to bring to one of our Del Ray Food Swaps. I also kept seeing the ingredient mentioned in recipes in the Jerusalem cookbook we added to our collection recently. So, I decided to made some as gifts for friends and family whom I know love to cook. It’s an easy project with a lot of great uses in the end. 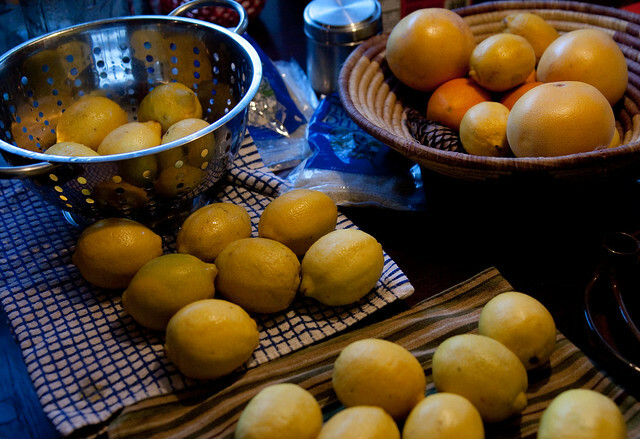 And a massive number of lemons – 6 to fit snugly in each of the jars and 3 more for each jar, for juicing. 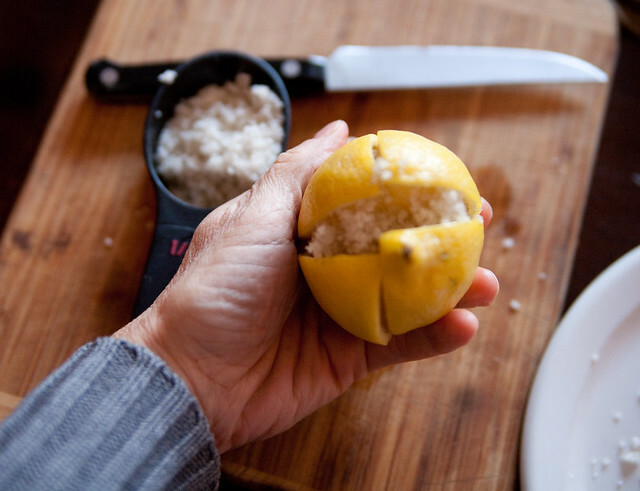 The recipe I followed in the Jerusalem cookbook, and in a few others I consulted, called for unwaxed lemons, which it turns out are hard to find. So, I scrubbed each lemon in warm water to remove the wax. 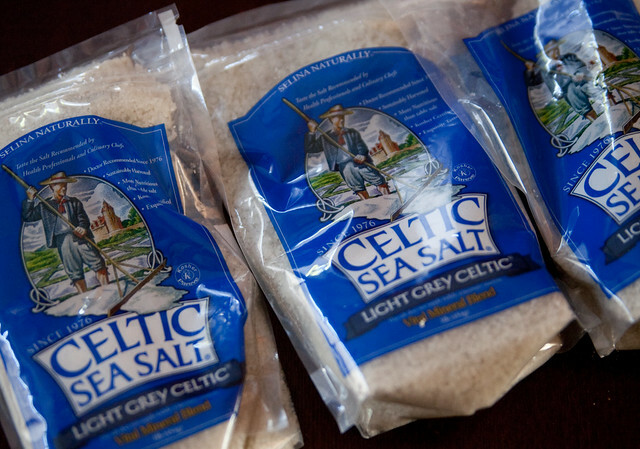 I also bought 3 bags, a pound each, of Celtic sea salt and a jar of bay leaves. After sterilizing the jars by washing them with soap and water, rinsing them in the dishwasher, letting them drain upside down on clean towels, and then drying them in a 300 degree oven for 15 minutes, I started prepping the lemons. I cut each one in a cross, 3/4 down. Then, I opened the center with one hand, and poured an overflowing tablespoon of the salt inside. I pressed each lemon closed and shoved it down into the jar. 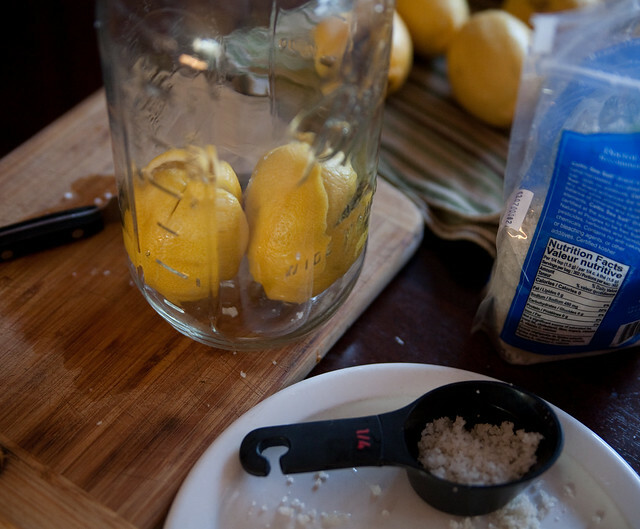 I poured more salt over each layer of lemons – close to a full package of salt for each jar in all. With each layer, I slipped in a few bay leaves around the sides. You can optionally add other spices like garlic, pepper corns, paprika, cumin, and turmeric. I also saw a recipe that says you can include red chiles, and some that include olive oil in the mix. I decided to only include bay leaf, so the recipients could have a more versatile pickled lemon to use with a wide range of recipes. Then, I squeezed lemon juice and added it in, until the liquid covered all of the lemons in the jar. I sealed the jars tightly and surveyed the sticky sweet carnage. My compost pile is very happy. 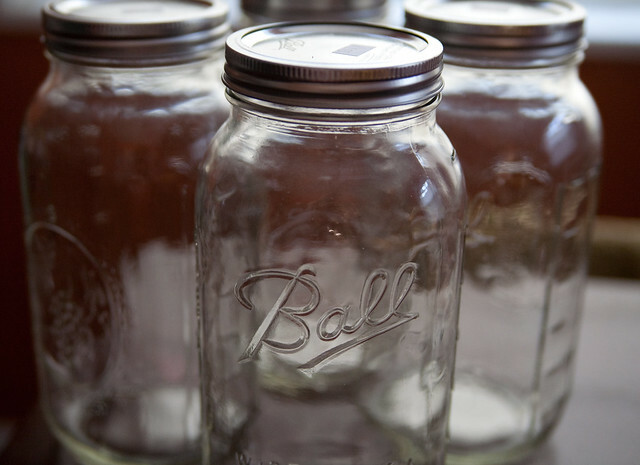 The jars should sit in a warm place for about 4 weeks. 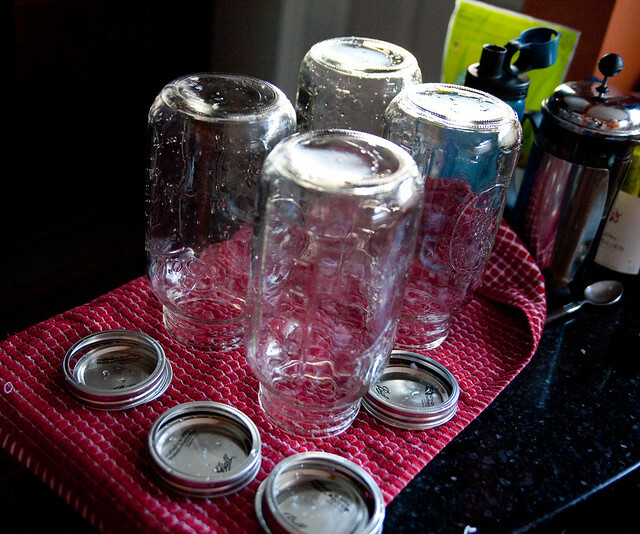 You can turn the jars upside-down to distribute the salt once a day or so. You can use the pulp and rinds in many recipes – Middle Eastern, Indian, and Moroccan, like chicken with lemon and olives, Moroccan lamb stew, salad dressings, and pasta sauce with olive oil and garlic. 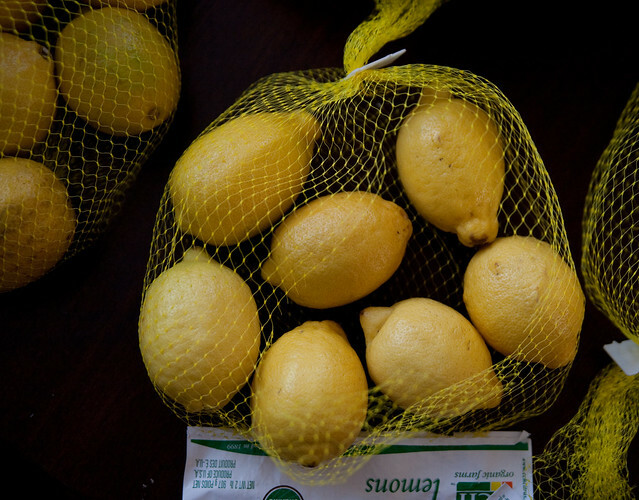 You will rinse the lemon pulps and rinds before cooking with them. 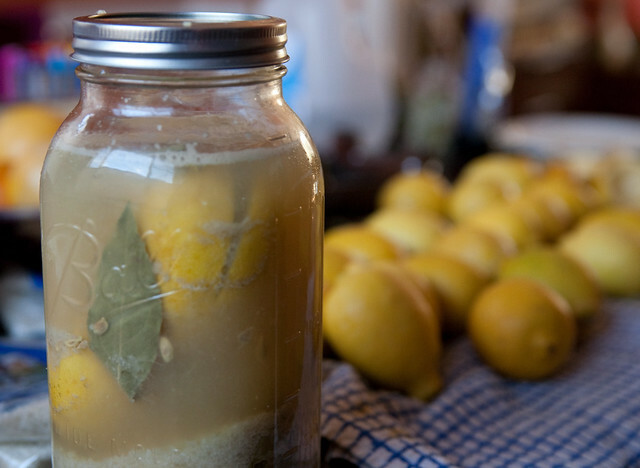 If you only use a few pickled lemons at a time, you can keep the rest in your pantry (refrigeration not necessary, but probably not a bad idea) for up to a year. 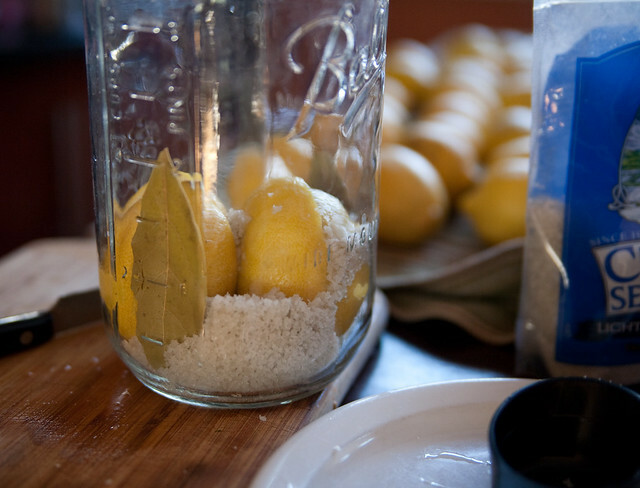 But just be sure to use clean utensils when removing a lemon so you don’t introduce bacteria to the jar. Evidently, the Meyer lemons (a hybrid citrus fruit from China originally) that we see in the market January and February are amazing to preserve (extra sweet and juicy with a thin, fragrant rind), so I may need to make a few more jars in the coming weeks. Good thing we have a food swap in the works for mid-winter too. Thanks for this post. Glad I was a lucky recipient of this beautiful gift. 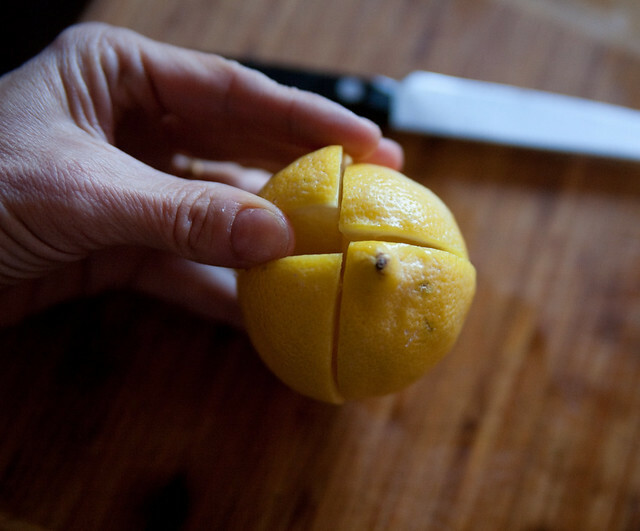 I am tempted to try this with Meyer Lemons from “The Lemon Ladies” (http://www.lemonladies.com/). 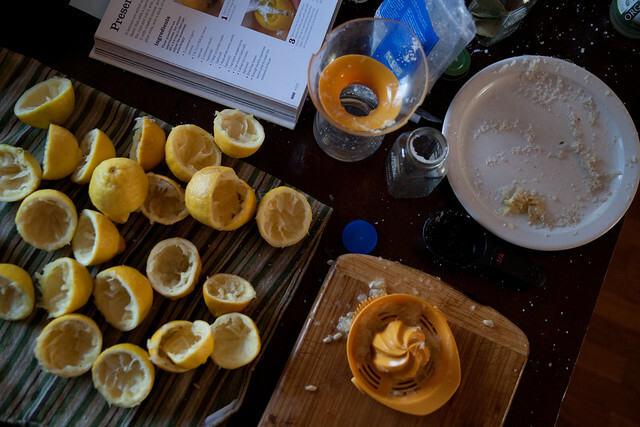 Many food blogs mention them as having the best Meyer Lemons on the planet!